Honda will in 2019 exit OEConnection’s CollisionLink and instead offer promotional collision parts prices through CCC Parts, a move the OEM and IP said would increase shop efficiency but a state trade group charged would do the opposite. The Auto Body Association of Connecticut last month criticized the arrangement and repeated its 2016 general opposition to CCC Parts, formerly known as CCC TRUE Parts. “Just as with the last time this program was introduced, once again the only two enterprises seemingly in place to benefit are insurers and CCC,” ABAC wrote in an April 16 position statement. Honda and CCC both said ABAC had not contacted them to discuss concerns prior to the announcement. According to Honda collision marketing group manager Leigh Guarnieri and CCC market solutions Vice President Mark Fincher, the partnership means CCC estimate writers can see both the list price and any Honda discount prices immediately when writing an estimate. Unlike parts procurement systems such as PartsTrader, the integration does not solicit bids; rather, it pulls prices automatically from Honda dealerships and competing recycled and aftermarket parts suppliers. Under CollisionLink, repairers saw both the list price and the amount of rebate available, according to Guarnieri. In CCC Parts, the discount is already baked into the second price shown, he said. Guarnieri said Honda dealers and shops are free to negotiate any further terms, such as the percentage the dealer knocks off either price to close the deal. “It’s in the body shop’s hands,” Guarnieri said. He said Honda’s found that shops don’t always have to use the discounted price to write estimates with OEM parts. “There’s a lot of OE-friendly insurance companies,” he said. Fincher said insurers cannot view the discounted prices; all they see are the list values. Nor does CCC share the discount percentages, he wrote, citing the company’s data policy. This would seem to address a key concern ABAC expressed in 2016 and again in April. “The ABAC similarly maintains genuine concerns about CCC One’s business of collecting so much data, all of which can, and likely will, be used against us down the road.,” ABAC wrote. Honda regulatory, legal and technology communications manager Chris Martin said the goal of the program was to increase the volume of OEM parts used. Honda wouldn’t do it if it didn’t make business sense, he said. 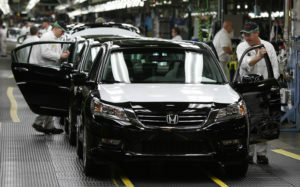 Guarnieri observed that Honda had an obligation to help its dealers, and it was trying to give them the best program. “It’s another sale that (a dealership) might not have seen,” he said. Honda is not requiring shops use CCC Parts to secure the discount, nor is it requiring even its ProFirst certified collision centers to use CCC ONE, according to Guarnieri. A shop can still contact a dealer manually to see if a discount was available, he said. “We’re not trying to block anybody out,” he said. “We believe this move by AHM will reduce efficiencies and further serve to hurt the auto parts market,” ABAC wrote. “Repair shops that do not employ CCC One are poised to suffer the most, and shops that use other estimating systems such as Mitchell, Audatex and others, would be forced to manually phone or fax their parts orders in to Honda/Acura parts departments in order to receive additional program discounts. “This process is not nearly as efficient or effective as the present Collision Link system. What is more, the Honda/Acura parts departments will be caused to spend countless unnecessary hours manually inputting program parts into the True Parts portal in order to receive reimbursements and pass them along to collision repair shops. By design or mistake, Honda has chosen to structure an arrangement with CCC One that now makes it more cumbersome and less efficient for non-CCC One collision repair shops. Guarnieri said the number of shops lacking CCC was minimal (some shops, he noted, have more than one estimating system). He called CollisionLink “a great program,” but said it made more sense for Honda to incorporate the system into an estimating platform rather than a parts procurement service on a different platform, accessed at a different time during the estimating process. “You can get in front of a lot, lot more estimates,” he said of the Honda-CCC Parts integration. Martin said Honda had done “quite a bit of research” into how it could improve parts ordering and increase the exposure of Honda OEM parts. “Our share of that business wasn’t necessarily as high as we thought it should be,” he said. Guarnieri said Honda solicited feedback from shops and dealerships and developed the program over a couple of years. “I’ll say this: The program has exceeded our expectations,” he said, then describing it as having “really exceeded” them. At just three months in formal operation, many shops already love the system, he said. Honda will continue to offer discounts simultaneously on CollisionLink through the end of the year, out of fairness to dealerships who’d already purchased a subscription under the prior parts program, according to Guarnieri. Following that, CCC Parts will be the only way to see promotional pricing immediately, he said. “I don’t think there’s a need to keep both,” Guarnieri said. Besides, Guarnieri said, CollisionLink wasn’t the only parts procurement system used by collision repairers. It’s not like Honda was going to design a system to work with each one on the market, he said. Fincher said CCC was piloting a similar partnership with “a few other OEMs” at a regional level. Guarnieri said Honda provides CCC with a file containing the necessary data, just as it does currently with OEConnection. However, as noted above, any percentage discounts offered by the dealership is the dealer’s business and isn’t dictated by Honda. According to Fincher, a typical parts procurement scenario involves a shop writing an estimate, identifying what parts they’d like to use, uploading it somewhere so a dealer can see it and either bid or provide a promotional price. 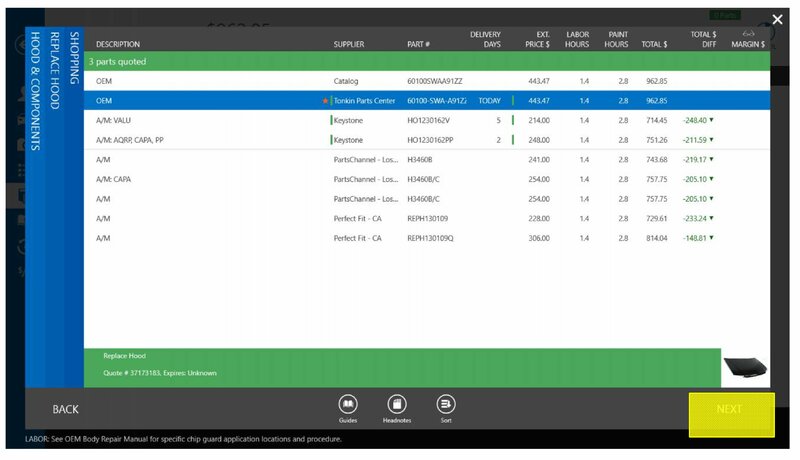 Under CCC Parts, parts types and list and promotional pricing automatically appear, and once the shop’s selected its parts, an order automatically goes to a dealer inventory management system, according to Fincher. “They just get the order,” Fincher said. Fincher said the integration with dealer management systems was “a little more complex,” for “you have to go dealer by dealer” versus, say, a single nationwide aftermarket part supplier. He said CCC goes market by market, starting with major metros and spreading out from there. However, he said the company’s Honda coverage was excellent, and Guarnieri said the same amount of “key wholesale dealers” existed under CCC Parts as did under the traditional OEConnection setup.